HOW TO CONTROL YOUR ANXIETY AND ANGER! Program yourself to STAY CALM, super-boost your positive mind-set and handle any challenges. Easily! Anxiety is Irrational and Useless. Do you suffer from the agonies of anxiety? Can you feel your heart pounding when you walk into a room? Do your hands shake when you’re forced to speak to someone you don’t know? Do you find it hard to catch your breath when feelings of dread roll over you like a thick, suffocating fog? Why do this to yourself? Anxiety is just not worth it! All anxiety stems from the same place: a fear of what the future holds, and an underestimation of your ability to cope with it. Once you realize that it’s within your power to cope with any situation, you’ll see just how wasteful all that worrying really was. It’s never gotten you anywhere in the past, and it won’t in the future either. Why waste your precious time on it? Do you lose your temper easily or find it difficult to let go of frustrations? Have you ever found yourself reacting out of anger in a way that you later regretted? Does your rage seem so strong at times that it scares people, including yourself? Have you ever been told that you should consider anger management? In the past, right back to caveman days, anger was vital for survival and for protection from danger, however, in today’s, 21st century, modern life, the stress surrounding these “fight or flight” responses can damage our body and mind unnecessarily. A temper eruption, just like a volcano, can destroy everything in its path once its force in full flow. Dr Jan has helped clients who visit her – sometimes as a last resort – husbands desperately seeking a solution as divorce is on the cards – the wife has had enough of years of walking on eggshells around them – to deal with their addiction to anger and turn their lives around happily. Dr Janet Hall Can Help! 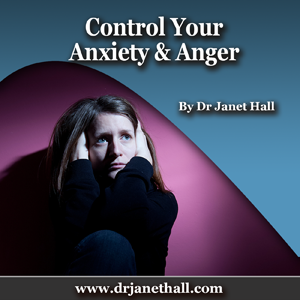 Dr Jan gives advice to help you to stop being anxious and angry, to get out of the loops of automated behaviour, to teach you how to think and respond appropriately and unconsciously to re-pattern the behaviour at a deeper level. It’s Time to Rejoin Life! There’s a whole life waiting for you. Think back to the kind of life you led before you developed anger and anxiety problems. That joy you once felt, the plans you once had for the future… they can be yours again!